I suppose not in a title, but behind it that I mean. What does the title say to the reader? I know what it tells me as the writer and the creator of that title that houses the innards of a literary jaunt into fantasy (not Fantasy, I enjoy watching it and occasionally reading it but do not write it) I called Two Struck Images. I had the treat one fall weekend in 1999 to host my younger brother at the 135th reenactment of the Civil War battle of Chickamauga. I had enough uniform parts and an extra rifle to fully outfit him (save for the shoes, I to this day still apologize for having to wear my old, worn out brogans that need re-soled). I was always the history buff and he went along for reasons of his own. I’d been away to college and then permanently settled in Albuquerque, New Mexico afterwards and married while he was in Atlanta, Georgia. I think he was glad for some company. With my reenacting battalion, the Army of the Pacific, we portrayed Heg’s 15th Wisconsin as our guiding impression and for the first day’s scripted battle. The 15th Wisconsin was part of the bloody action that took place on the Viniard Farm and suffered heavily on that first day’s combat. At the event was a period photographer and he and I sat for two images to be struck. Two different poses, two different images and we each kept our favorite to take home. Some time later I was looking at my own image and penned this short story of two brothers and the images they possessed. I titled it Two Struck Images for the story told of the battle and the tie one boy finds with that past when found he finds one of the images 150 years later. Today I have commissioned someone to edit the story and someone else to do the cover image and for the first time I was confronted with the difficulty of my title. I conceived of it and titled it and to me it ties things together. From here on out, however, I need to step away from it as the writer and approach it as a reader who knows nothing of what I know about the two images and the role they play in the story. Hard to do. I only get one shot to appeal to someone, I want to toe that line between engaging mystery and confusion. Please leave other thoughts in the comments section. If you have other title suggestions leave those too. Short story to be released on Kindle in May. Author phil1861Posted on March 29, 2012 Categories Short StoriesTags battle of chickamauga, Civil War, Indie Publishing, short story, soldiers4 Comments on What’s in a title? 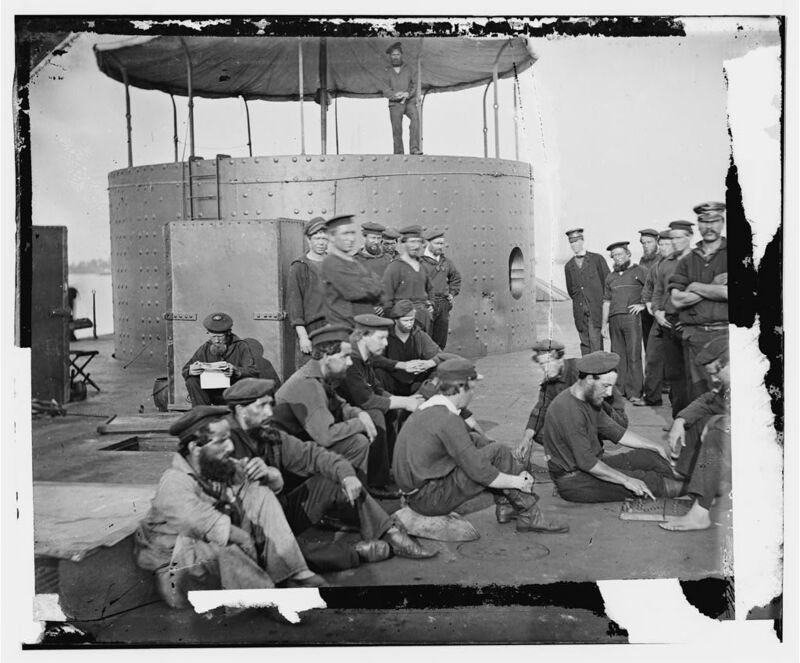 Author phil1861Posted on March 22, 2012 Categories Civil War SolderingTags blacks in the navy, civil war navy, naval uniforms, USS Monitor2 Comments on Hey there, sailor. I like this image; it has a great view of the crew requirements for a battery of artillery to function. Pictured here are 20 pound Parrot rifled cannon, distinctive for their rifle like design, heavy reinforced wrought iron band at the breach and narrow muzzle. The image above is of a battery drill outside of Ringgold, GA by men of Sherman’s army. If you enlarge the image you will get a taste of the dress and manner of the western soldier. In many paintings and movies, artillerists are oft depicted wearing the short shell jacket trimmed with red piping. 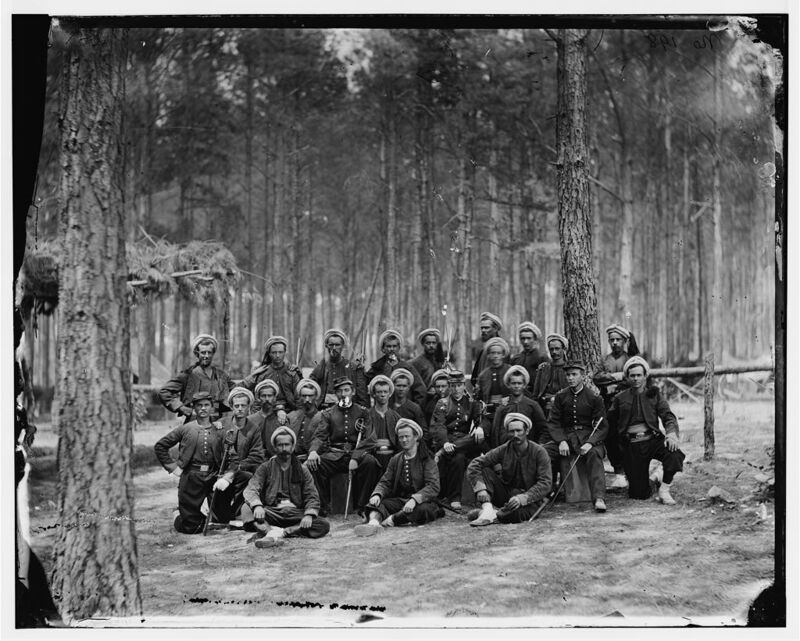 The men above are all clad in the infantry fatigue or “Sack Coat”. There could be several reasons for this. Quarter Master supply for replacement uniforms, the men were volunteers from infantry regiments, the battery was always issued the base federal infantry uniform. Atypical for western troops are the kepi and forage caps in evidence. Western infantry regiments liked to be as individualistic as eastern ones tended to be for pomp and polish. The western soldier’s headgear was often a civilian black hat or what came to be known as a “bummer” or “slouch” hat, an army issue dress or Hardee hat without the trim (brass bugle, ostrich plume, branch of service cord, cockade that held the left brim to the side of the hat). The hats were cooler and offered better sun protection and were more akin to what was worn on the farm on a daily basis. 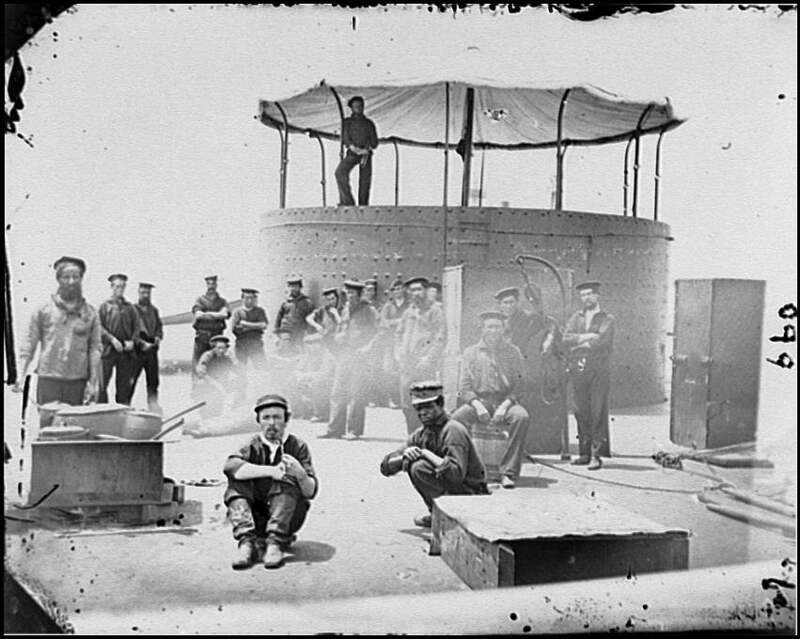 The gun crews, arrayed in their positions each had a specific role to play in the service of the weapon. Gunner: the man usually directly behind the tail of each gun. His responsibility is the aiming and giving the command to fire each his piece. Cannoneers: there are four cannoneers, numbered left to right whose posts are at each wheel edge, so 1 on the left wheel with the sponge/rammer, 2 directly opposite, 3 behind 1 and 4 behind 2. These men do the loading, firing, and cleaning of the gun. Cannoneer 5: this is the poor chap who gets to run back and forth to fetch each new load. The leather pouch worn by each number 5 is used to hold the round. In this image the limbers are a little closer than they would be if the battery were being engaged in real fire. The images of stacks of cannon balls by a cannon make good displays but a cannon being serviced does not want live ammunition anywhere near it. While it may be the pride of its own forces, it is also the target of every artillery battery opposite and infantry near enough to fire on it. Each round is carried singly from the limber chest to the number 4 man who loads it into the barrel, and the number 1 man who rams the charge home. Between each fire the number 1 man douses the barrel with the sponge killing any live spark. Cannoneer 6 and 7: these men are stationed at the limber cutting fuses and prepping rounds for fire. We can also see on the limbers the men who are charged with driving the teams on each limber and from each caisson. Not everyone on a horse is an officer and often the two cannoneers 6 and 7 would ride the rear of the limber and two others on the rear of the caisson. (The caissons are shown behind each limber) The number 4 man of each team wears a pouch on his belt with the friction primers for the touch hole of each piece. The primer contained a mercury filament that ignited when the lanyard (attached to the primer) was pulled igniting the powder that was loaded before the round, the touch hole being wide at the top and then narrow at the bottom to direct the spark. One primer, one shot. Take out one of these men and the rest have to double duty as there is always a man with the teams to bring them up to limber up the gun to be moved. Take out a horse and the same follows, the efficiency of the whole group is diminished. 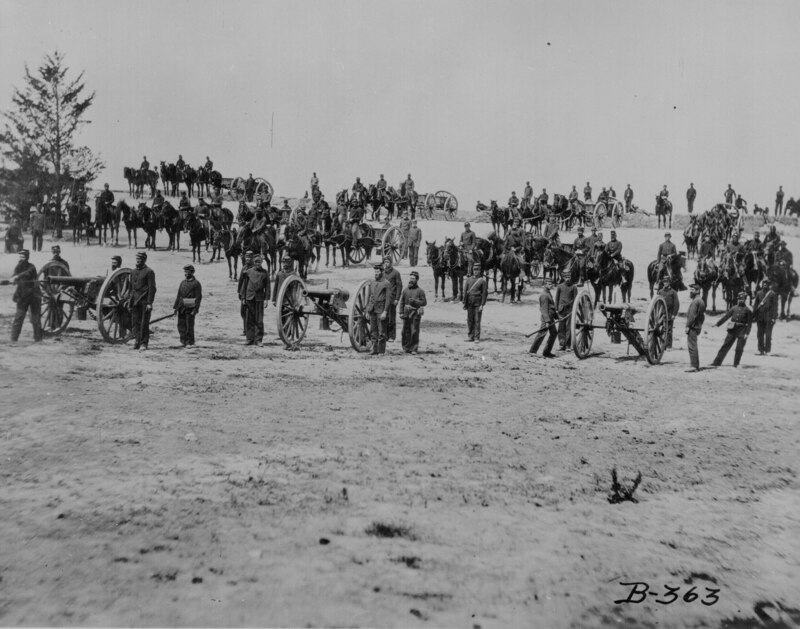 You can see from this image (above) how many horses were required to move a battery about. Images like the one below from the Gettysburg battlefield shows the cost in horses during a battle, this being of the Trostle farmyard where they 9th Massachusetts Battery was posted.